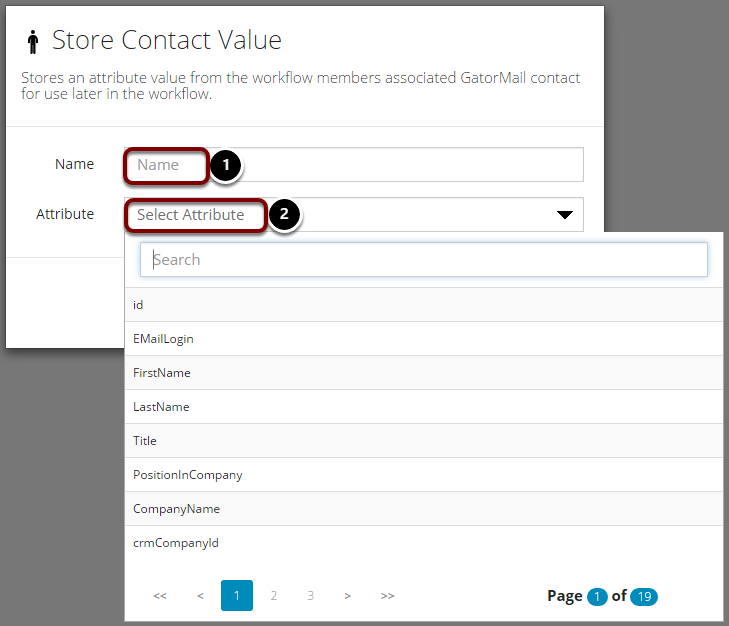 This retrieves an attribute value from a Workflow member's GatorMail contact record, and stores it in a named location (stored value associated with a Workflow member) for use later on in the Workflow. For example, if you would like retrieve the member's email address you could name the stored value as 'EmailAddress' and select the 'EMailLogin' field from the attribute list. Or you could hold the value of a member's total lead score for use in conditions or calculations later on in the Workflow. You can optionally monitor the contact's value held in GatorMail for any changes, and bring these into the Workflow. The below screen is displayed by dragging the stage to the canvas. Name the stage. This is what your stored value will now be known as within the Workflow. Select the contact field you would like to retrieve and store. If you would like any updates to the field to be reflected in your Workflow, check this box. This can be useful if the value is a date that is updated throughout the year.